Imagine if you were able to predict - with consistent certainty what exactly your potential buyers are going to ask you? What if you could know ahead of time what challenges they may raise or how they view you and your offering versus your competition? What if you knew exactly how to sell to them - what to say and how to say it? 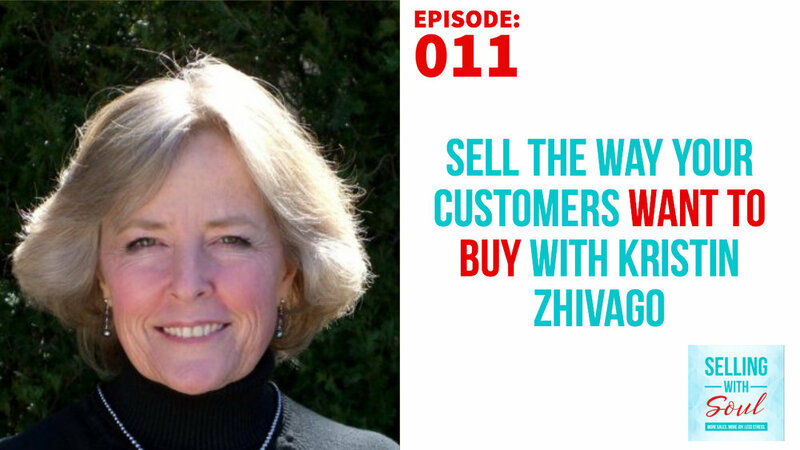 On today’s episode of the Selling With Soul podcast, we are talking with Kristin Zhivago about how entrepreneurs and business owners can build sales and marketing processes that are completely designed around and aligned with how your clients want to buy. Kristin is the president and founder of Zhivago Partners, a digital marketing management company, and the author of Roadmap to Revenue: How to Sell the Way Your Customers Want to Buy. Zhivago was one of the first to identify that it wasn’t how we sell that matters; it is how well we support the customer’s buying journey. She has been writing and speaking about marketing for years, training marketers worldwide. Prior to founding Zhivago Partners, Zhivago was a revenue coach to CEOs and entrepreneurs, mostly in the tech industry, specializing in marketing and sales department turnarounds. Many businesses neglect to mine the vast amount of knowledge that sits, waiting for them in their current client list. If we as business owners and sales people were to ask our clients the right questions, at the right times - we could find out everything that we ever wanted to know about our clients and how they prefer to interact and buy from us. What platforms are they looking for us on? what questions do they have for us? What do they value about doing business with us? The answers are all right here. Our clients are more than willing to unlock all of the sales and marketing secrets that we have been looking for - if we only ask. We dive into all of the details on how to get this done in today’s episode. What sales or revenue generation challenges are you facing right now? Do you have questions around the best way to grow your business – like, should you introduce a new distribution model or hire a salesperson? Or maybe youre looking for some guidance on how to close that big dream account or make your sales quota for the year?